Professor Syed Hussain, Chair in Oncology and Consultant in Medical Oncology at Derriford Hospital, has recently joined the University of Plymouth’s Institute of Translational and Stratified Medicine (ITSMed), bringing with him research expertise in management of urological cancers, clinical trials, early drug development and translational medicine. 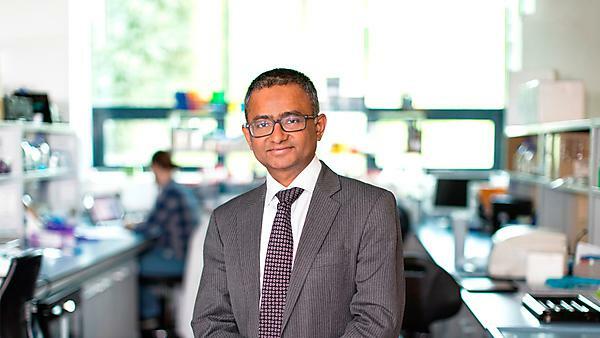 Following his recent publication of a study in The Lancet, Professor Hussain discusses a potential new treatment for bladder cancer, and explains why tackling the disease is so important. No one wants to hear they have any form of cancer – but bladder cancer, especially when it has spread to other parts of the body, is particularly difficult to treat, with the average survival in the range of only 14-15 months. Diagnosing it at all is often very difficult, as sufferers don’t always show symptoms, and it can quickly spread - becoming what's known as 'metastatic'. Life expectancy for sufferers falls considerably in a second-line setting – the stage where they receive their second treatment – to around eight months, and treatment options and awareness of what’s available are relatively limited. Bladder cancer is serious and relatively unrecognised. But, by working with colleagues from institutions across the world, steps have been taken that highlight a potentially new therapeutic option for people with advanced metastatic bladder cancer. Published recently in The Lancet, a study (doi: 10.1016/S0140-6736(17)32365-6), that I co-authored, and on which I am a co-investigator, shows that patients in a second-line setting who took a combination of existing and experimental drugs – known as docetaxel and ramucirumab respectively – had a delay in disease progression. This is compared with those who took the existing drug docetaxel with a placebo. The new combination stops new blood vessels from forming, effectively starving the cancer, and results showed that the addition of experimental drug slowed down the progression of the tumour from approximately two to four months. Median overall survival has not yet been reported and it’s too early to debate if and how this treatment could be rolled out, but the results are very exciting. Ramucirumab plus docetaxel is the first treatment in a phase 3 study to show superior progression-free survival over chemotherapy in patients with advanced metastatic bladder cancer. The fact that this is a phase 3 trial is also very significant: phase 1 trials are usually small and broad in terms of the people they recruit, phase 2 trials are slightly larger in sample size and look at whether a new treatment is as good as an existing treatment and, if successful, these then move into phase 3 – a larger trial comparing new treatments with the best currently available treatment. A total of 530 patients from 124 sites in 23 countries were recruited for this trial, and a blinded central analysis demonstrated consistent progression-free survival results. It really is very promising. After years of research on bladder cancer, and receiving patient referrals from far and wide, I feel very proud that we’ve achieved findings that are something of a breakthrough. I am delighted to see a changing landscape in the management of advanced metastatic bladder cancer with a number of new exciting drugs on the horizon to help our patients fight bladder cancer.